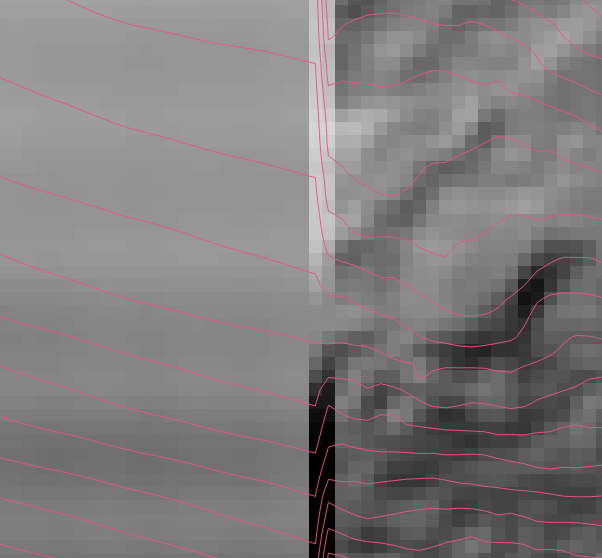 I have a LiDAR dataset with some missing data right in the middle of my map. I would like to use a 5m DEM to fill in the missing areas. Is there a way in QGIS to merge the two but only use the 5m data in the missing location? Crop, upsample, and smooth your low-res data to match your high-res data; you may also need to reproject the SRS. The coördinates given as arguments to -te (south-west and north-east corners in the projections units, at least for UTM) should be large enough to cover the area missing from the high-res data but the area covered shouldn't be much too large because the low-res DEM will be upsampled to the higher resolution. Smoothing the low-resolution data (e.g. with -r lanczos) is important; if omitted you'll end up with a blocky, checkerboard pattern in the low-res areas. 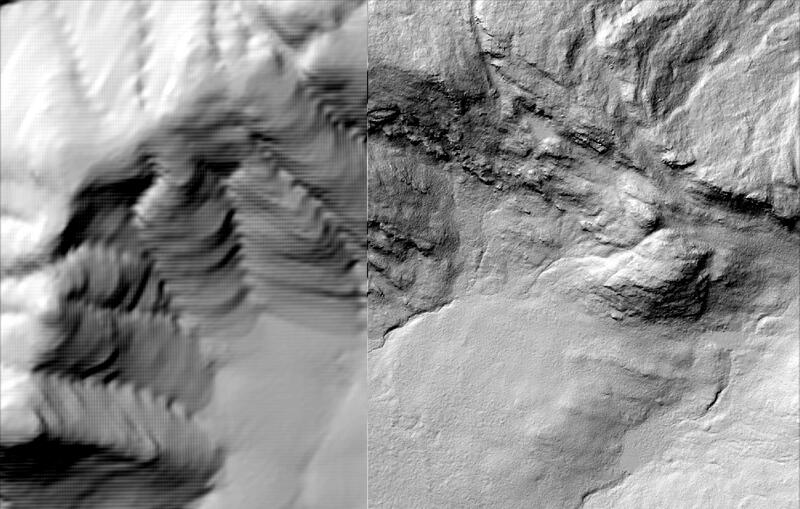 In areas of overlap, the last image will be copied over earlier ones. I'm not sure how to handle the visible lines at the high-res/low-res boundaries. When I've encountered this in the past the solution was to combine all of the input files into a single VRT file. In this case, however, using a VRT file makes no difference. You can do this from within the QGIS GUI using Processing -> GRASS -> r.patch (https://grass.osgeo.org/grass70/manuals/r.patch.html), which will fill in areas of no data in an input raster using data from another raster. This does not do any form of smoothing though, so you will still end up with blocky edges as per the answer from @Alex Hajnal above. It is bit tricky in QGIS. But is very well established in ARCGIS. Go to toolbox-->data management--> Raster--> Raster dataset--> Mosaic to new raster. Be sure about the order in which two rasters displayed i tool and choose mosaic operator "First" or "Last" accordingly. You can use it for multiple rasters also, but be sure the order in which the layers are displayed in the tool box and arrange them as per the order in which it has to be looked at. Not the answer you're looking for? Browse other questions tagged qgis raster dem merge missing-data or ask your own question. How to fill empty pixel from DEM using QGIS? How to fill holes/missing values in XYZ data / a DEM with QGIS? Merging vector (building) elevations into DEM in QGIS?